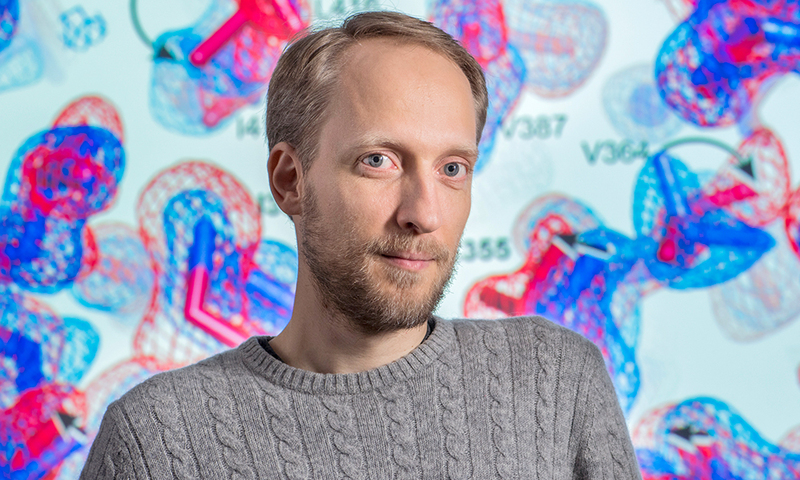 Doeke R. Hekstra, MCB’s new Assistant Professor of Molecular and Cellular Biology and an Assistant Professor of Applied Physics for SEAS, came to Harvard with an unorthodox plan to measure the motion of proteins: just add electricity. “Proteins have charges all throughout their structure, [so] if you put a large voltage across a protein crystal, you should be able to move things around,” he said. In essence, he plans to taze the proteins to discover how they move. Hekstra’s latest venture will be the focus of his new lab at MCB. He has already demonstrated that electrocuting the protein does indeed induce motion in the crystals, which he described in an article for Nature (PDF) in December 2016. The goal of this technique is to better understand the relationship between protein form and function. PDF“Now the plan is to develop that into a systematic approach to get a mechanical description of how a protein works,” he said. Hekstra began his academic career in The Netherlands, where he studied chemistry first at the University of Groningen and later at Leiden University. He came to the US through the Tri-Institutional PhD Program in Chemical Biology (TPCB), which was established as a graduate program in 2001 for students who want to focus on the intersection of chemistry and biology. The program allows students to study at three universities in New York – Weill Cornell Medical College, The Rockefeller University, and the Memorial Sloan Kettering Cancer Center – and emphasizes research and mentorship. This something turned out to be the study of artificially constructed closed ecosystems. Hekstra’s advisor, Rockefeller University professor Stanislas Leibler, was inspired by the closed glass ecosystems that can be bought in some museum gift shops. The ecosystems contain a few organisms in filtered water encased in airtight glass, and can internally sustain themselves by only adding light. The results of these experiments were published in high-profile, multidisciplinary journals like Physical Review and Cell, and focused on topics like population dynamics over time and biological contingency—the observation that in biological systems random events can have long-lasting consequences. For example, in a paper for Physical Review with Hekstra as first author, Leibler’s team observed population dynamics in the closed systems and tried to separate real trends from random fluctuations by measuring the average dynamics of the system. By replicating the experiment over and over, they were able to evaluate the quality of the data from each system and determine which factors may be random. The goal of these experiments, of course, was to see what could be observed and used to make inferences about ecological dynamics in larger systems. By using simple, controllable, replicable systems, the team hoped to develop observational and measurement strategies that could benefit more complex questions. Hekstra clarifies that the problem of scale is not necessarily a matter of size. Wild ecosystems are complicated by the number of competing species and the variability of conditions, but proteins are complicated by their structural complexity and the sheer number of ways that they can move and react to their environment. This problem was one that Hekstra tackled in his postdoctoral work at the University of Texas Southwestern Medical Center in Dallas, with his advisor Rama Ranganathan. The problem as Hekstra saw it was that although techniques like nuclear magnetic resonance spectroscopy allow researchers to see the structure of proteins rather well, their movements are harder to determine. He says that a protein might have thousands of degrees of freedom, but that only a select few might be important. He compared the study of proteins to finding an unknown kind of machine. If you don’t know how it operates, your first attempt to learn about it would be to start pushing buttons. Observing the outcome throughout the machine while you manipulate it could give you clues about what is happening inside. “That was the philosophy of the experiment,” he said of his current work with electrodes. “Now we have a way to put force on a protein and see it move.” His work on electrifying protein crystals was published in Nature (PDF) in December 2016. For now, Hekstra is not thinking about the larger implications of his work, but he is interested more broadly in the question of protein evolution. He wants to use his electrode process to observe the differences between natural and lab-created proteins, especially in regards to their physical structure. Hekstra officially began at Harvard in October 2016, but delayed setting up his lab to take a planned trip to the Stanford Synchrotron in November in order to finish up some of his postdoctoral work on protein imaging. He began setting up his lab in earnest in January. 2017 has been a very eventful year for Hekstra and his family, which grew in May when he and his wife welcomed their new baby. The family, including one other child, has settled in Brookline. This summer, beyond exploring Boston and Cambridge, Hekstra will begin working with his new postdoc and a G1 rotation student on continuing his protein research. Hekstra has not ruled out returning to ecosystems in the future, if that is where the research takes him. “I’m interested in the same questions of how do you study evolution when you can only see specific instances,” he said. “There’s only a little you can do at a time in science. Try some things, and see where it takes you.